What better way to intimidate your enemies than with a gun that shoots angry wasps? 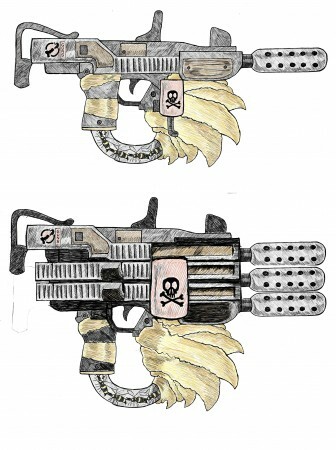 Here we have the Craven Hornet, a heavily modified Uzi that does just that. In fact, it shoots three at the same time. To make matters worse for the target, each hornet has been fed an aggression serum, amplifying their sting and causing them to bolt toward the first thing they see. This entry was posted on Monday, August 6th, 2012 at 12:00 pm	and is filed under Main News.